With finals week just a few days away, here are a few so-close-to-winter-break study tips to get through finals week safe and sound. Check ‘em out below! 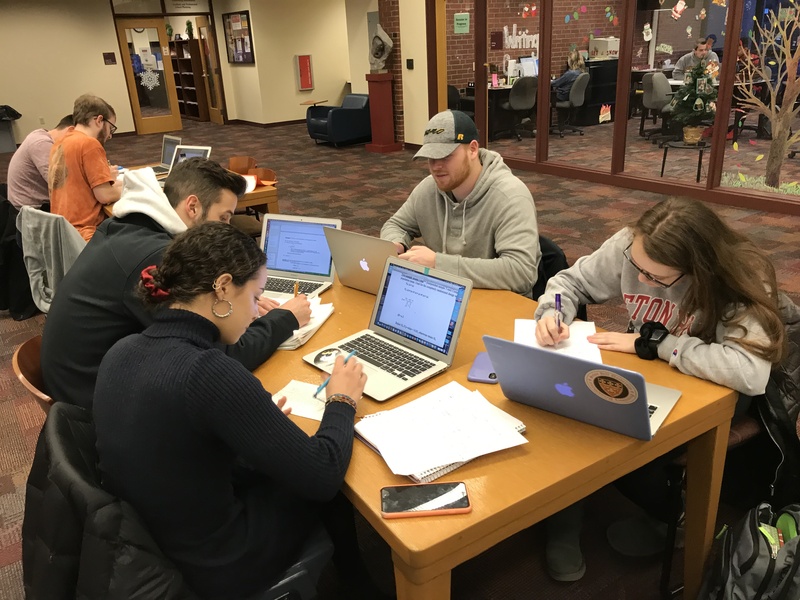 A group of Seton Hill students study in Reeves Learning Commons the week before finals. Photo by P.Parise/Setonian. 1. Organization is key! Keeping up to date with assignments and exams helps you stay on track. 2. Study in increments. Taking breaks often will keep you refreshed and focused. 3. Turn your phone/electronics off. Turn them off or put them away from view. Staying on task is important and phones can be a huge distraction. 4. Keep music/distractions low. Playing music while studying to get into focus is great, but there’s always a time where one zones out and then it’s suddenly a distraction. Keep it low or turn it off after five minutes to get working. 5. Change of scenery. Going for a walk or studying in a new place keeps things fresh and your mind clear. 6. Stay hydrated. Making sure to stay nourished while studying. Drinking plenty of water along with getting some healthy snacks during and in between study time is very important. 7. Do not cram. Prepare prior to finals week and pay attention to the material you don’t know. 8. Be creative. Change up how you study with flashcards, sticky notes or different colored highlighters. This will help to memorize important material. 9. No stopping now. You worked hard all semester so why begin to be hard on yourself now?! Only a few more days ‘til break! 10. Keep a good attitude. Being positive about school work makes it a whole lot easier. 11. Set goals for yourself. Plan to reach an end goal for each class to help stay focused.